Smartcity, as a concept, has motivated me, personally, to do something better each time and make cities digitally literate and smarter. As I have been working towards the concept of Smart city and Smartcity apps, I came across hordes of groups, communities, companies and others Government bodies, which were working towards the same aim and are making efforts to encourage others, like us, through different means. Talking about the Government, since the new government has come in, their focus has constantly been on Smart India and its Smart Cities. Under this governance, the ‘Atal Mission for Rejuvenation and Urban Transformation (AMRUT), a Smart Cities Mission’ has been launched. Under this system, the ministry has as much role to play, as the citizens like you and I do. On the other hand, the big head of Silicon Valley, Microsoft itself, has taken an initiative on the same front. In the first week of November, I had read that “Microsoft to provide $120,000 Azure credits to startups working on smart cities” which was announced by CEO Satya Nadella at the American technology company’s ‘Future Unleashed’ event in Mumbai. Thanks to Rahul Savdekar, Director – Industry Solutions (Government) at Microsoft helped me to get the enough details for the event. While Microsoft itself is involved in this ‘Accelerate India Mission’ it has also recommended four seed funding firms, namely, Telangana Hub, GenNext, Deshpande Foundation, Ashoka University. Amongst the four firms recommended by Microsoft, I attempted my luck and the efficiency of my product by applying in. That firm was Deshpande Foundation. As its procedure goes, I attempted at presenting our Smartcity311 app, showing the way it works and the problem it solves, trying out and Yes! We made it to #1 position. So happy that, our solution #SmartCity311 won the Global Entrepreneurship week’s sandbox challenge with the seed funding of 100,000 INR at Deshpande Foundation, Hubballi. When the jury truly knew about the app, its functionality and the way in which it involves public participation in tracking the issues of potholes, garbage cleaning and others, they took not a second longer in giving their decision. I would like to Thank You Sandbox Startups, a Deshpande foundation and HDMC (Hubballi-Dharwad Municipal Corporation) and now looking forward to provide this solution for Hubballi. While this was my experience per se, this what the Facebook page of Deshpande Foundation says about Smartcities and their importance in India’s growth. 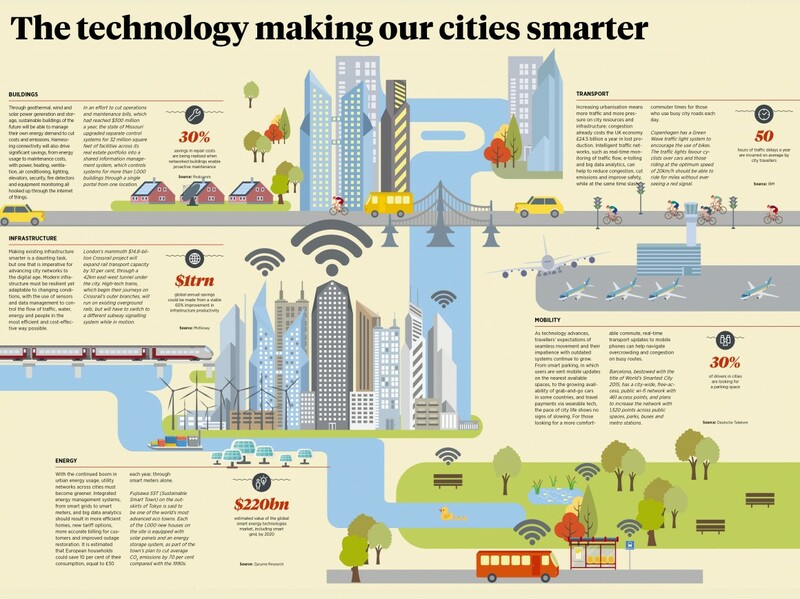 Infographic outlining the top smart city technologies transforming our urban hubs across the world, focusing on 5 key sectors – buildings, infrastructure, energy, transport and mobility – and the cities that are pioneering development. This has proved to be a great start towards the journey we have planned to undertake. iPromise is our Flagship product, which is an acronym for “Intelligent Program for Maintaining Integrated Street Light & Energy System.” This system was created to keep a check on the much important system of Street Light Maintenance. It is a complete web and mobile based solution that creates a system for the regular checking and maintenance of street lights. iPromise is currently being implemented at Surat Municipal Corporation (SMC). VBD Tracker, build using Microsoft technologies, was created to enable the officers of the Health Department in regulating and ensuring compliance. This app also assists them in performing regular inspections and enforcing other everyday activities for the prevention and control of vector & water borne diseases like Chikungunya, Dengue, and Malaria. This app makes our cities safe and smart. These apps are merely a beginning to the dream that I have sown in the roots of EverythingCivic. And we have many other ideas that will, as time passes, become solutions to the core problems that are stopping many cities from becoming Smartcities.